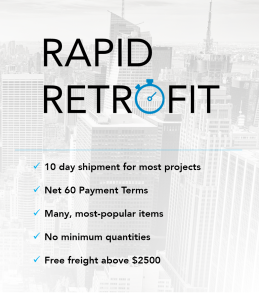 The rapid retrofit program provides 10 day lead time on most projects for many of our most popular items. There are no minimum quantities. We even provide Net 60 payment terms to support project timelines! 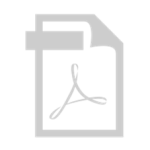 Applicable Rapid Retrofit items can be found on our Program Guide. We will work directly with you on your project to accommodate shipment within 10 business days, 2 business weeks. We do run out of some products from time to time, so product configuration and available quantities do vary and we will make our best effort to work with on your projects. Our products are manufactured to extremely high tolerances and are tested extensively before our leaving our dock. Larger quantities orders, on some product configurations (above 100 pieces) may require a bit of additional time. We will contact you and let you know if that is case. To expedite delivery, and prevent delay of your order, we ask that only Rapid Retrofit items are placed on a Purchase Order. Non Rapid Retrofit products should be placed on a separate Purchase Order. Product configuration and availability are subject to change, we will do our best to deliver to your expectations.